Photo 1. 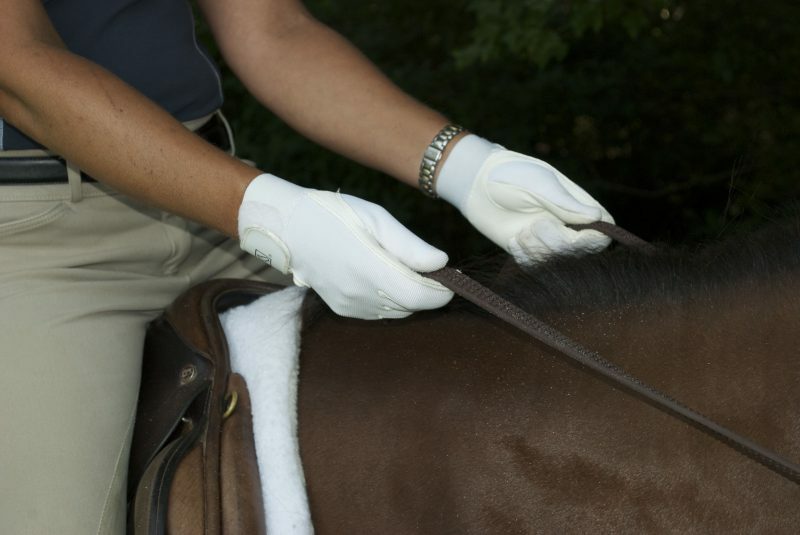 Holding the reins like driving lines from the horse’s mouth over the index finger and through the palm of the hand. Do you tend to pull back on the reins? Do you tense your shoulders? Are you holding back instead of allowing your horse to use his head and neck over a jump? Here’s a quick tip to help. Next time you ride notice how you are holding the reins. Are your shoulders tense? Do you pull back with your hands? Does your horse complain about your contact? Over a pole or cross-rail do you forget to let your arms go forward? Riders often have trouble following the horse’s head and neck over jumps, especially if you have only used a crest release. It is easy to get in the habit of pulling back instead of giving forward towards your horse’s mouth. When riding transitions you might not even realize that you have locked your wrists or pulled back because it is only a small amount (to you). In order to retrain this habit ride while holding your reins like driving lines especially over cross rails and small jumps. You will quickly discover if you are using your reins for balance! Photo 2. One rein held like a driving line and the other as a riding rein. To hold the reins like driving lines have the rein come from the horse’s mouth over the top of your index finger and then through your hand. In this position keeps your wrist from cocking or rounding. Also you don’t have as much strength in your hand with the rein coming over your index finger instead of up through your hand. The ring finger gives you a lot more hand strength than you might realize. Start on the flat going slowly until you get a feel for the reins in this position. What happens when you ask your horse for a halt? Do you elbows go well behind your body? Or can you keep your arms in front of you? Do you feel a bit out of control? Ride at walk, trot and canter before you head for a pole on the ground. Make sure to test out your jumping position at the trot. Notice that you can’t use your hands for balance anymore because you might tip forward if you pull your arms back. Photo 3. Both reins held in the typical riding position. Once you are well acclimated with this rein position begin over poles and small jumps. Feel how you have to follow your horse’s mouth with your arms. Then after you have gotten used to the idea hold one rein as in driving and the other for riding (coming under the ring finger, through the palm of the hand and over the index finger). Having the reins in two different positions may be a bit confusing at first. But this is a great way to retrain a habit. 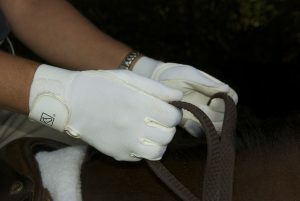 Switch which hand holds the driving and riding rein. Finally hold both reins as for riding and feel the difference in your contact from when you started. Are you able to follow the horse’s mouth better now? Are you more relaxed in your shoulders? Use this Murdoch Minute to improve your contact with the reins. Warm up over poles and cross rails with driving line reins to ensure that you follow the horse’s mouth and find your balance. And always remember to – Enjoy the ride!